Green and Purple Wedding Badge. This 25mm badge has the text Bride To Be in a fun purple font. 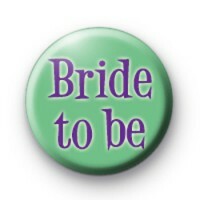 Are you getting married soon and looking for some handmade badges to give out to your Bridal Party, family & guests. Our badges make fun keepsakes from your big day and we have hundreds of lovely wedding badges in the shop, many of them can be customised.